The rugby league season’s biggest tragedy is about to become one of the code’s greatest triumphs. 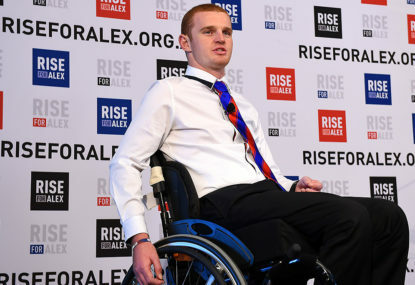 This weekend is the ‘Rise For Alex’ round in the NRL and in all the time I have covered the game, nothing has been more inspirational nor compelling than the concerted pull for injured Newcastle forward Alex McKinnon. The 22-year-old backrower suffered a career-ending spinal injury in a tackle during the Round 3 clash with Melbourne Storm at AAMI Stadium. McKinnon has spent the ensuing four months in intensive hospital care, fiercely determined to recover and one day walk down the aisle to marry his fiancée Teigan Power. Alex’s story has been documented far and wide, but this weekend many new chapters will be added as the sport of rugby league unites to show him an extraordinary level of support. The code’s administration has decreed Round 19 the Rise For Alex round, and the public rally for McKinnon has already triggered phenomenal support. The round will be as much a fundraiser as a show of support for the popular Knight. It will be a weekend charged with emotion, both on and off the field, as the ginger-haired Aberdeen lad returns home to Newcastle and his beloved Hunter Stadium for the first time since he suffered the injury on March 24. The game against the Gold Coast is a guaranteed sell-out. The Newcastle community has been waiting for this day to show McKinnon he is not alone in his brave rehabilitation battle. At a packed media conference earlier this week, McKinnon said, “It’s going to be a slow and long process but I am willing to do that. I’m 22 and I’m going to give it my best shot. “I’m there for a couple of days and it will be my first trip away from hospital in about four months, so I’m really looking forward to getting back and seeing family. “I was even saying to my fiancée Teigan the other night, I just can’t wait to go back to my house. Some of the money raised will help pay for modifications to Alex’s house so he can eventually return there. “As much as I would love to get home and get back to my family and get back to Newcastle and get on with my life, I want to walk again,” he said. “You see a lot of stories about people who get on with their life and don’t walk again. My focus is to get as much back of my movement as I can and I am slowly improving. McKinnon now has full head and neck movement with good muscle strength, good shoulder movement, partial finger movement, thumb movement and full elbow and wrist extension and flexion, which enables him to manage a manual wheelchair for short distances on flat surfaces and an electric wheelchair at other times. The Rise for Alex round will see the code unite like never before. The NRL will donate one dollar to the Rise For Alex Fund for every fan who attends any match this weekend. Fans can make donations by purchasing a RiseForAlex wristband, to be sold at all matches, online at riseforalex.org.au, or by texting RiseForAlex (0498 555 555). Channel Nine’s Footy Show, in partnership with Telstra, is holding a Telethon tomorrow night to raise funds for McKinnon’s ongoing treatment. Phone lines will open at 8.30pm with operators taking donations (1800 441 991). The Daily Telegraph is generously donating one dollar for every paper sold on Saturday. Around the NRL, there will be other notable shows of support. Cowboys captain Johnathan Thurston will wear a special No. 16 jumper in McKinnon’s honour, while St George Illawarra star Trent Merrin will auction the boots he wears in his milestone 100th game for the Dragons. Before the Bulldogs versus Tigers game at ANZ Stadium on Sunday, the Wiggles will make a special live performance. NRL ticketed members and fans who buy a ticket to any NRL game this weekend will get free entry to the stadium as part of the fund-raising initiative for the Rise For Alex round. Down through the years, league folk have been asked to dig deep for flood and fire victims at NRL games, but this weekend’s dedication to Alex McKinnon is going to be extraordinary. History shows that the game is pretty good at giving itself black eyes, but this weekend I am delighted to predict rugby league will rise above everything for a champion young man who embodies all that is good about sport and life itself.